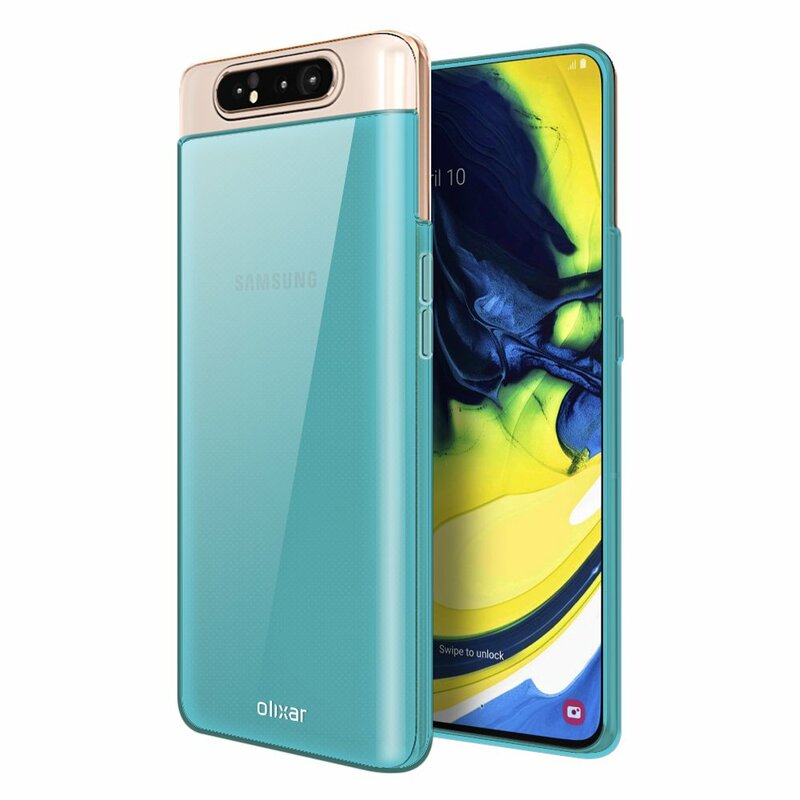 When Samsung announced the Galaxy A80 with its sliding and rotating camera mechanism, an obvious question came to everyone’s mind: How would cases work with this phone? The top rear part of the Galaxy A80 slides up and the rear camera assembly flips 180 degrees when you want to to take selfies, and it requires thinking outside the box when designing cases for such a device. Casemaker Olixar has done exactly that with two of its Galaxy A80 cases. 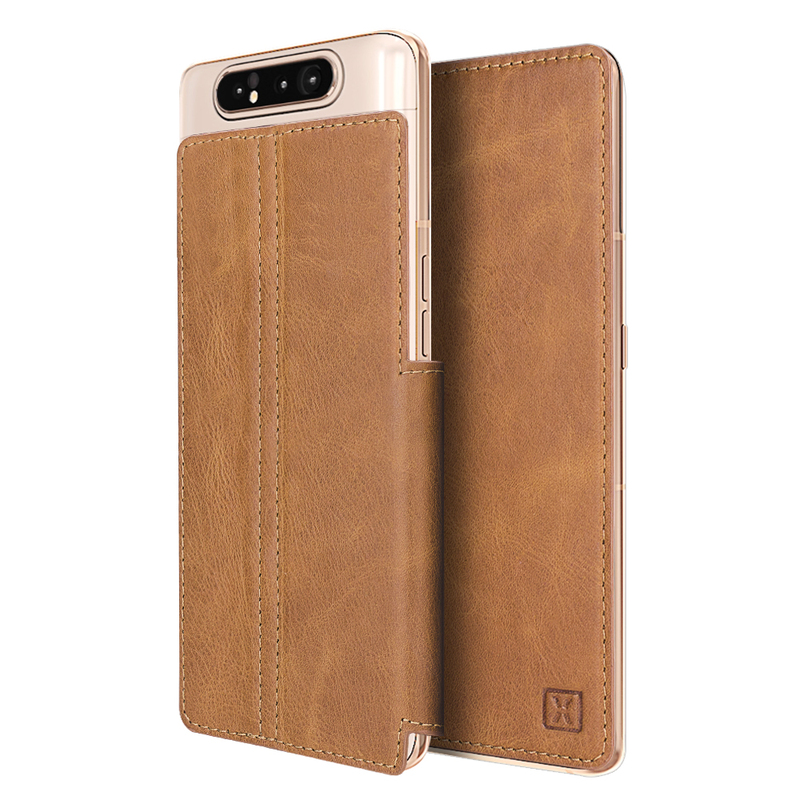 The more interesting of the two cases is the “low-profile genuine leather flip case,” which uses adhesive to stick to the back of the phone instead of using a clip-on system like regular cases. As a result, this case doesn’t cover the bottom of the phone; it also doesn’t cover the sides completely nor the camera part of the device. The camera and the sliding top half are left bare in the gel case as well, but the gel case does protect the phone’s bottom and the sides of the device. However, neither case offers complete protection, and we’re guessing this limitation will forever persist for a device like the Galaxy A80. Compared to competing phones like the Oppo Find X or the Xiaomi Mi Mix 3, the A80’s camera assembly is rather thick because of the three sensors, and the rotating mechanism further complicates things. Hopefully, the next phone with a pop-up camera from Samsung will have a more case-friendly design. What do you think of these cases? Does Olixar’s solution look good enough to you, or do you think this incompatibility with regular cases is a huge issue for the Galaxy A80? I can’t see leather case on the mobilefun page. How it should look ? What about Samsung official cases ?